In order to understand the capabilities of PanCam, we have created visualizations of the ExoMars rover and the PanCam calibration hardware being designed and manufactured by Aberystwyth University. The images were generated by Helen Miles. A portrait view of the Panoramic Camera (PanCam) – the ‘science eyes’ of the ExoMars Rover, led by Mullard Space Science Laboratory, UCL. PanCam features three cameras, each for distinct purposes: at each end, the Left and Right Wide-Angle Camera (WACs) get a stereo view of Mars, while the camera offset from the centre is the High Resolution Camera (HRC). The PanCam Calibration Target (PCT), as seen by the High Resolution Camera (HRC). Knowing the exact colour of the glass circles on the PCT will allow scientists to correctly adjust the colour of the images returned from the rover. When the High Resolution Camera (HRC) is centred on the calibration target, this is the view of the PanCam Calibration Target (PCT), as seen by the Right Wide-Angle Camera (WAC). 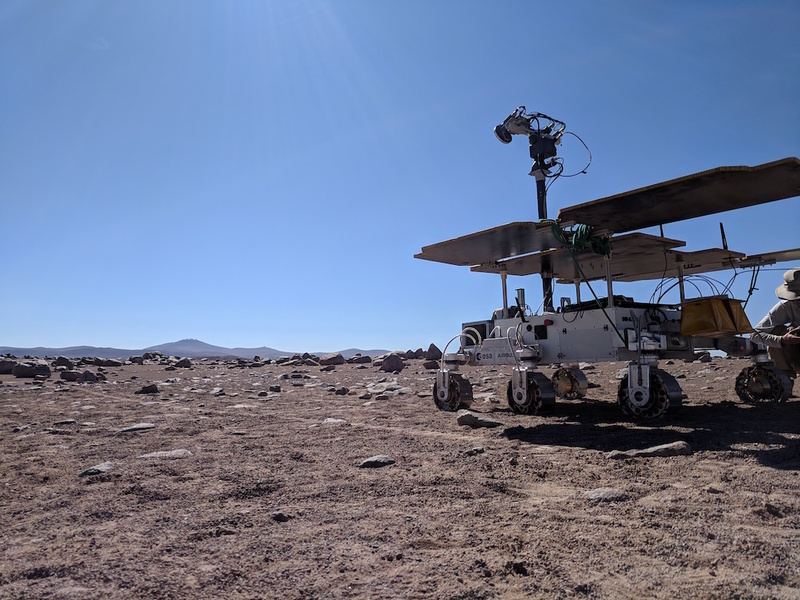 You can also the Fiducial Marker (FidM) on the front right side of the rover. When the High Resolution Camera (HRC) is centred on the calibration target, this is the view of the PanCam Calibration Target (PCT), as seen by the Left Wide-Angle Camera (WAC). Because HRC is closer to the Right WAC, the PCT is only just in view for the Left WAC. The Rover Inspection Mirror (RIM), as seen from the High Resolution Camera (HRC). When the drill is collecting a sample, the RIM allows PanCam to see underneath the drill box – in this image the rover is in the process of drilling to collect a sample of Martian rock. The Fiducial Marker (FidM) on the left side of the rover, as seen by the High Resolution Camera (HRC). The three FidMs are located at precise positions which will allow scientists to geometrically calibrate PanCam. The Fiducial Marker (FidM) at the back of the rover, as seen by the High Resolution Camera (HRC). The three FidMs are located at precise positions which will allow scientists to geometrically calibrate PanCam. The Fiducial Marker (FidM) on the front right side of the rover, as seen by the High Resolution Camera (HRC). The three FidMs are located at precise positions which will allow scientists to geometrically calibrate PanCam. A portrait view of the ExoMars Rover based on the science instrument model with a simplified body design.